InSanity lurks Inside: The PolerCoaser is Happening! 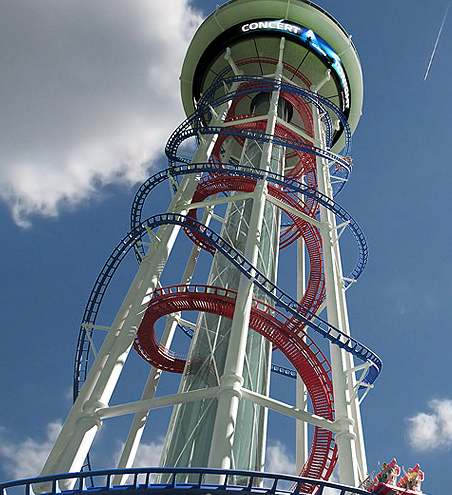 The crazy idea of the PolerCoaster WILL happen! Created by US Thrill Rides, PolerCoaster was just a concept until this years IAAPA (International Association of Amusement Parks and Attractions) convention started yesterday. The current announcement is that LakePoint Sports Complex, near Atlanta Georgia will be getting one. It's also semi-confirmed that Orlando, Florida will also receive one although this announcement hasn't happened yet. Rumor suggests that the Orlando announcement will come within the new two weeks and that both towers will break ground at the same time in 2014, suggesting a possible opening date of 2016. 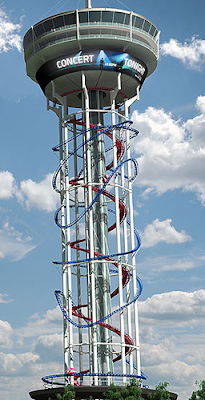 Many wonder where exactly this will appear in Orlando, as a quick guess off the top of my head I've believe the most likely target would be the new "I-Drive Live" project which will also play host to an "Orlando Wheel" similar to the London Eye. Also in this area will be a Madam Tussauds and an Aquarium. PolerCoaster is stated as "Delivering high thrills in a small diameter footprint is a recipe for economic success. The vertical nature creates an amazing visual experience with potential for exceptional lighting options and signage that can provide ancillary revenue streams". This idea has been floating around for about a year now with many believing Las Vegas would surely be the first area to jump on the idea. However, it looks like both Georgia and Florida will be getting something first! More information has conformation happens!